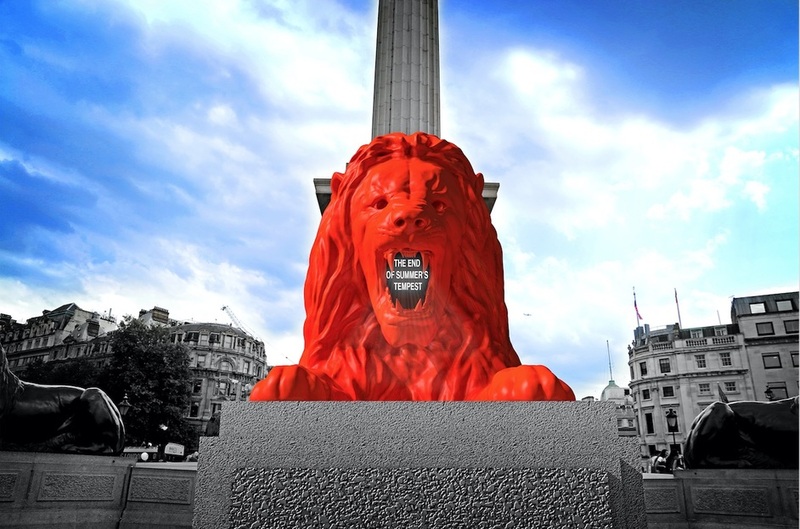 A fifth, fluorescent red lion joins the pride in Trafalgar Square this September. London set designer Es Devlin, who has created stage sculptures for Kanye West and Beyonce, catwalk show sets for Louis Vuitton, and stage designs for the National Theatre, invites you to 'feed the lion'. The words you supply will be shown acollective poem shown on LED embedded in the mouth of the new lion. At night, the words are projected onto Nelson's Column to become a beacon of streaming text inviting others to join in and add their voice. This lion roars. What are the best dining options near Es Devlin: Please Feed the Lions London? Es Devlin: Please Feed the Lions gyms, sporting activities, health & beauty and fitness. The best pubs near London Es Devlin: Please Feed the Lions. Es Devlin: Please Feed the Lions clubs, bars, cabaret nights, casinos and interesting nightlife. Where to have your meeting, conference, exhibition, private dining or training course near Es Devlin: Please Feed the Lions. From cheap budget hotels to luxury 5 star suites see our discounts for Trafalgar Square hotels, including The Trafalgar St. James London, Curio Collection by Hilton from 81% off.